The list of documents which you need to submit for your ERAS application is rather impressive. Apart from your MSPE, medical school transcripts and dean letter, you will also need to submit your ERAS personal statement. The latter, according to the writers from residencypersonalstatements.net, is your best chance to stand out from thousands of other applicants and explain why you deserve a place in a residency program. Our residency personal statement service prepared some useful tips on ERAS personal statement writing which will help you succeed. As the matter of fact, there are no strict instructions concerning the length or eras personal statement word limit of your ERAS personal statement. However, a compelling and strong paper does not exceed one A4 page and consists of about four paragraphs which cover the basics, the maximum your ERAS personal statement length can reach is 750 – 800 words. Paragraph 1: This paragraph should introduce you to the reader in brief but engaging form. Paragraph 2: The second paragraph ought to explain how and why you have chosen your medical specialty. Paragraph 3: The third paragraph aims at supporting your choice with the examples from your professional and personal life. Paragraph 4: The final part of your ERAS personal statement should be centered around your long-term goals, as well as the ways in which you can benefit from the residency program. And vice versa. Once you have the skeleton of your ERAS personal statement ready, it is high time to edit your paper. Give yourself plenty of time, for you will most likely need more than one revision. Do feature your brightest academic achievements and career plans for the future. Just restating the same information that can be found in your CV, application documents. Dealing with ERAS personal statement writing alone might turn out to be a tiresome task. As an applicant, you need to be able not only know how to express your thoughts in a logical way to show your strong points but at the same time always keep in mind the correct structure of your papers. Additionally, apart from keeping eras personal statement word limit, you need to catch the right words to start and remember about ERAS personal statement font, perfect length, as well as what to avoid. Luckily, there are services like our residencypersonalstatements.net which can help you out. Our expert personal statement writers want to underline that your paper should be 100% authentic and perfectly written to make a strong impact. We guarantee to help you with writing ERAS personal statement that will meet all requirement of your application program so it would be easier to get the desired fellowship. 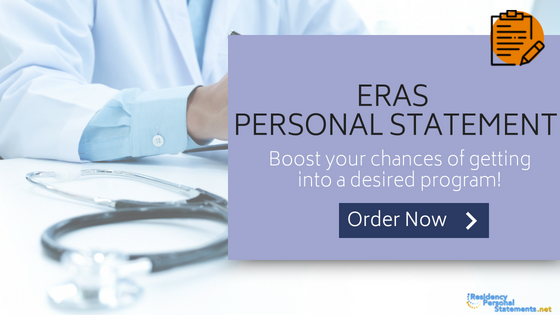 Rely on our high-qualified experts and get your improved ERAS personal statement! Be the one who gets enrolled!